SS: What were your inspiration, your dreams, and the driving catalyst behind French & English Confectioner's? Lucie Gonnord: After studying shoemaking at Cordwainers, I started to develop an idea for a design label that would enable me to hand-make my designs. Making is as important to me as designing. Sitting in an office designing for someone else has never appealed to me. I wanted to continue the tradition of hand-making shoes which has all but died out in this country, and use old equipment and lasts. Making shoes is a very time-consuming process, with little financial reward. You have to do it for love! Making bags too has helped me create a more viable business. SS: What does French & English Confectioner's mean to you? Lucie Gonnord: An old sign painted with the words French & English Confectioner’s was revealed during a shop refit opposite my boyfriend’s work in Tufnell Park. He’s a chef and wanted to use the name for his restaurant. After a bit of persuasion, he very kindly gave the name to me, as it fit so well with my ideas. For my website I wanted to create the atmosphere of an old-fashioned shop, and I’m half English, half French. I found out later that the definition of a confection also used to apply to a shoe. I asked a local who had grown up in the area, and he remembered the shop and the jars of sweets in the window. Lucie Gonnord:The first item I designed for F&EC’s was a pair of women’s shoes, inspired by the Roxy Music song Virginia Plain. They were navy blue 5in platform Mary-Janes with a cream frill down the side, and only came in one size. I didn’t sell any! 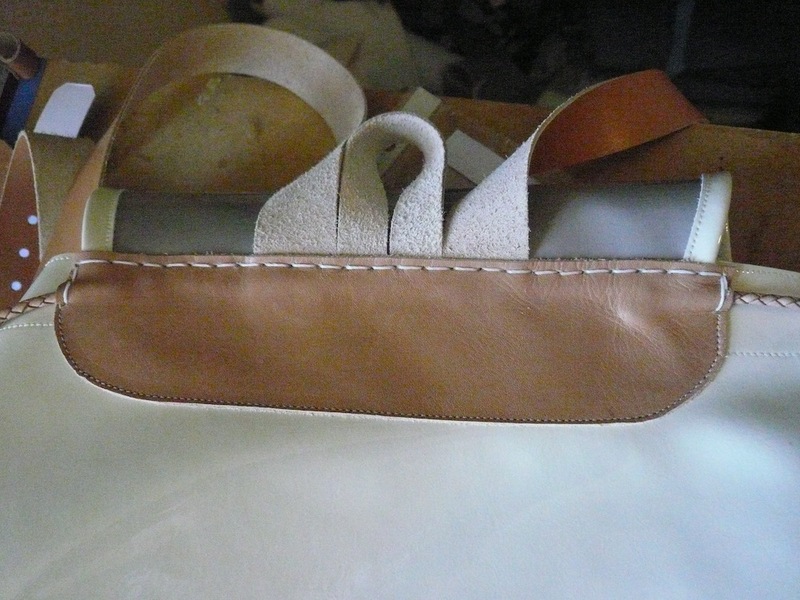 I’m currently working on women’s t-bar sandals with a hand-stitched sole. I’ve never made shoes this way before (I normally glue the soles), so it will be a challenge. 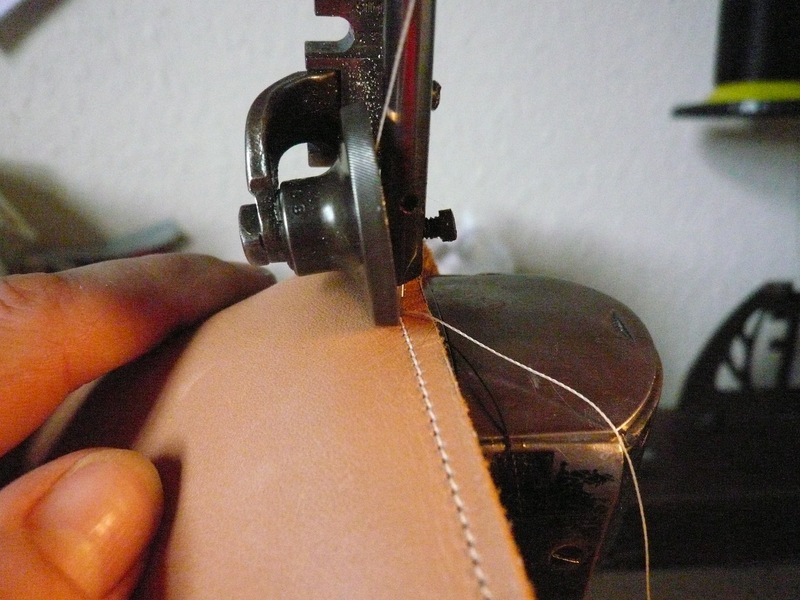 I love stitching by hand, and this is a traditional technique in shoemaking. I’m beginning to incorporate hand-stitching into some of my bag designs too. SS: As all of your designs are expertly handmade in London, craft and local manufacture are obviously very important to you. Can you talk us through some of the process involved in creating your bags? What can you tell us about the workshop? 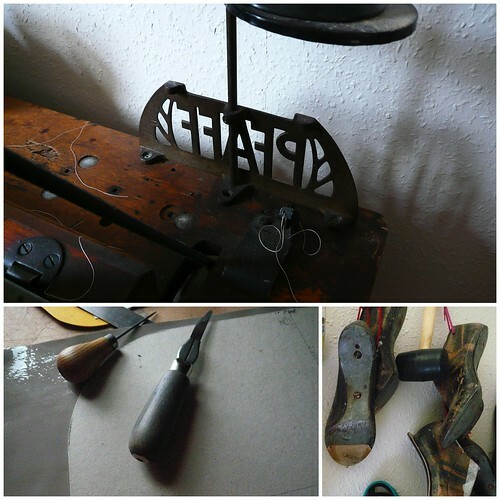 Lucie Gonnord: After making the pattern, which takes a lot of time and thought, I cut the leather by hand and prepare all the straps, fittings and buckles. 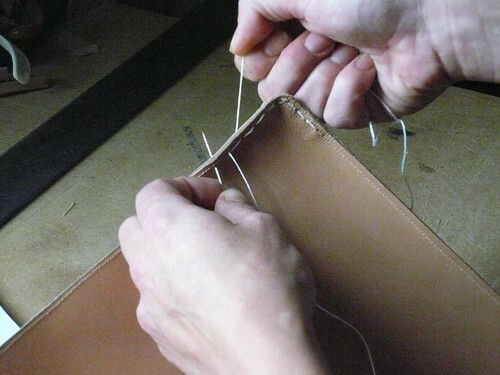 I skive (make thinner) the leather for trims by hand. I sew everything on my 1930’s machine, which has a post bed especially made for shoemaking. It’s a bit of a beast and unbelievably heavy, but still works really well. Then I fit all the eyelets and rivets. 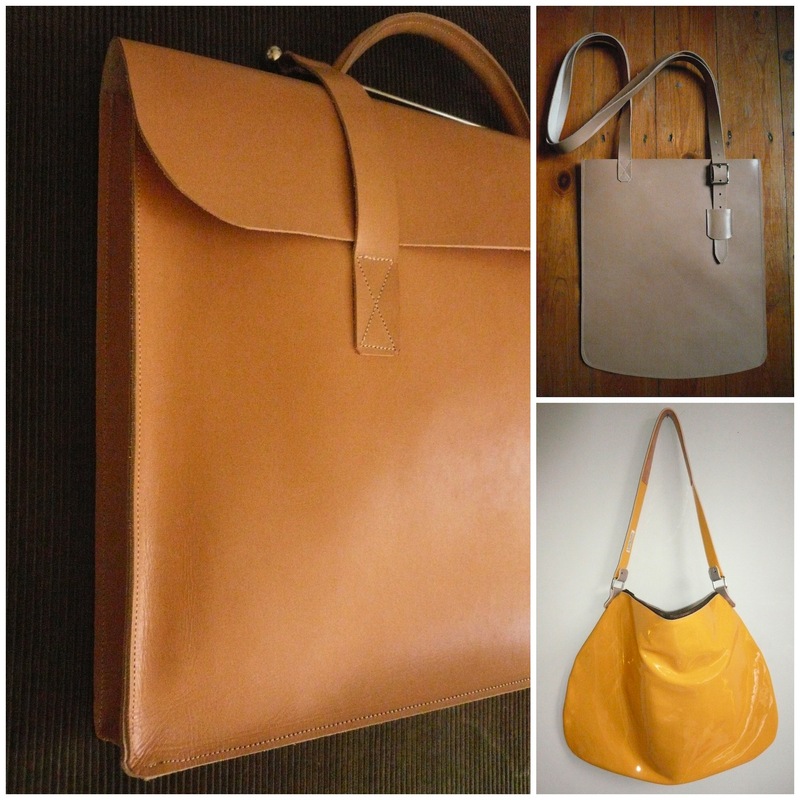 SS: Could you talk us through your current range of bags for men and the inspiration for each? Lucie Gonnord: I designed a music case, inspired by one that my brother had as a kid. It was vintage even then, and had J. Arrowsmith scrawled in ink on the inside, so I named it after that. It’s perfect for carrying a laptop in. 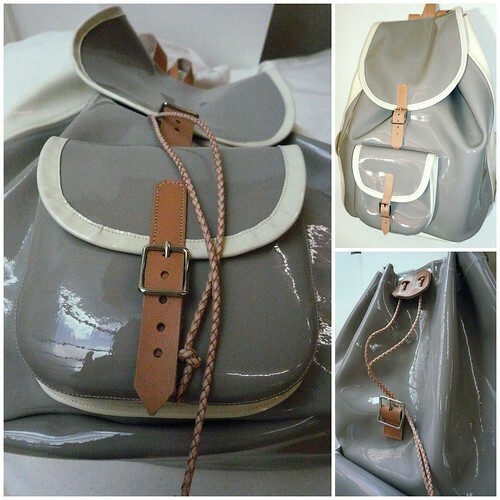 The patent leather rucksack was specifically designed for men, but works well as a unisex piece. It’s based on the classic canvas rucksack you used to see everywhere in the 70s, but can’t get anywhere now. The two-tone patent gives it a modern reworking. The weekend bag was the design that started me making bags. I was going to Paris for the weekend and didn’t have any chic luggage! I then made one for my friend, Stephen, who cycles everywhere. He was impressed that he could fit and carry four bottles of Prosecco in it! It also works well as an everyday bag. I still use mine all the time. Making it made me realise that bags could be a good addition to my designs. SS: The website informs us that men's shoes will soon be available. As a self confessed shoe obsessive, what would you like to see on men's feet? What does the new collection look like? 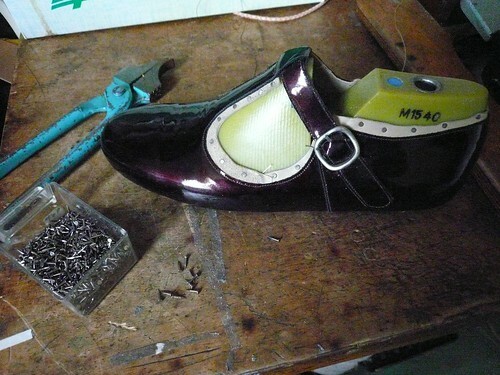 Lucie Gonnord: I only use vintage lasts for my shoe designs, as I want to re-use old equipment rather than buying new. I’m still looking for a set of men’s lasts, it’s difficult to find a full size run, but as soon as I do I will design a small collection for men. Most of my designs are re-workings of old classics, so I’d like to make simple, wearable shoes, which hopefully will be unique and interesting, but not over-designed. I like the fact that more men are now wearing proper shoes, like Church’s, and getting away from trainers. I also have a hatred of flip-flops, so a nice, smart covering of the feet always makes me happy! Designing for men is always a challenge, finding the balance between something interesting and something men actually want to wear. Lucie Gonnord: It’s nice to see more men wearing smart, classic accessories and coats, and investing in pieces that will last. I prefer stylish to fashionable, especially on men. The patent leather rucksack in all its beauty. SS: If you could go back in time and experience any moment in style, what would it be? 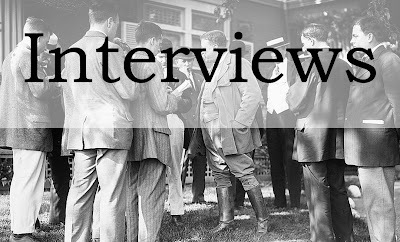 Lucie Gonnord: The 1930s and 40s, when all men wore hats! And people looked after and repaired their clothes and shoes. People seemed generally to be more well-groomed then. Now it’s so easy to run around in jeans and trainers, I’m the worst for it when I’m busy, so I really admire people who make the effort to look dapper. SS: Finally, how do you see French & English Confectioner's developing over the next few years? Lucie Gonnord: First of all, I want to build up the business to a point where I don’t have to work as well! My aim was always to make an OK living out of it, but it takes a lot of time and hard work to feel secure enough to take the leap. Building up the label online is my first priority. Then hopefully I’d like to open a shop/workshop. If you’re paying for somewhere to work, it makes sense to be able to sell from it as well. I also think it’s good for people to see things being made. When I have more time, I’d like to start making more shoes again. Taking on apprentices is something I want to do in the future. It's always consoling to admire the finer things in life especially when in great distress.